What’s the difference between a merely good audition and an exceptional one? Often, it isn’t a matter of which singer sounds better, but rather which one goes beneath the text to express something that’s personal – that comes from a real place. In order to do this, we singers must work like actors, learning to draw on our life experiences to inform the texts we sing and the characters we portray. When these techniques are applied, our work is transformed and songs and arias literally come to life! We are able to put our own individual stamp on whatever we sing. David Ronis, having worked professionally as both a classical singer and actor for 25 years, has a unique angle on how to combine the two disciplines. He brings the perspectives of each to bear upon the other, successfully incorporating easily accessible acting techniques into songs, arias, and musical theater pieces. David’s approach to acting, building upon methods developed by Uta Hagen and Sanford Meisner, activates singers’ organic impulses and encourages personalization of material. 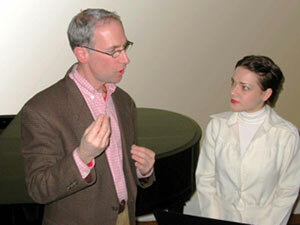 Using these methods, he helps singers get to the heart of a piece and put their own personal imprint on it. With an extensive background and firm command of the repertory for both classical singers and musical theater singer/actors, David is available to coach repertoire and prepare audition material privately, in small groups, or in larger master classes. David coaches on the Upper West Side of Manhattan. For more information and rates, please email or phone.